Gail a little high for her 50th Birthday...The Best Location to Skydive. 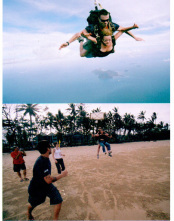 Professional Tandem Skydive Masters will take you on an exhilarating, unforgettable adventure. 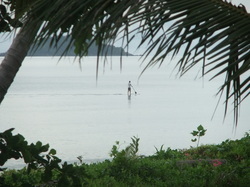 From 9,000 feet in the air you will view the 14km of our sandy beach, lush rainforest and Dunk Island. 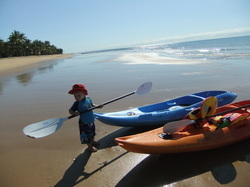 Zac our grandson getting in the act... We have two kayaks available for you to enjoy at your leisure. Sail to nearby Family Group of islands including beautiful Dunk and Bedarra and a little south to the largest National Park island in Australia, Hinchinbrook Island where you can enjoy peaceful serenity. 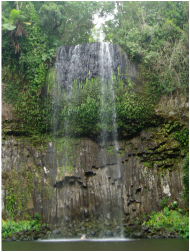 Hiking and wilderness trails are on the islands for those who wish to experience our tropical natural rainforest. 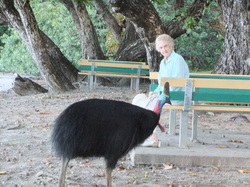 Australia's largest bird the cassowary. These birds can be seen crossing the roads in the rainforest areas. This friendly fellow is found at nearby Etty Bay. The North has a local racing calendar. 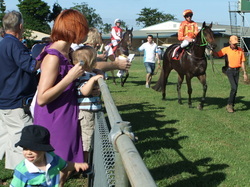 Innisfail Turf Club is more than 100 years old and boasts the best country track in the north. If you are luckily to be staying when the Innisfail Annuals is held, it is the party of the year. Why not spend day fishing, snorkelling or diving the sparkling waters of Australia’s famous Great Barrier Reef. Day trips to the outer reef are available; enjoy the stunning turquoise water with many types of corals and reef fish. 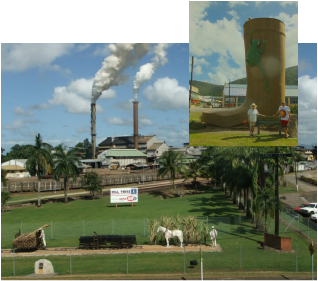 Join a tour of the Tully Sugar Mill where steam billows out of tall chimneys, and long cane trains make their way to the mill carrying the cane. Due to the Great Barrier Reef and islands off our shores there is only gentle waves, but this doesn't stop Jake from riding his board.